The Lionel Hampton School of Music became a GRAMMY Museum Affiliate early this year. This makes the University of Idaho one of only sixteen GRAMMY Museum University Affiliates across the country, and the second University Affiliate in the northwest. The GRAMMY Museum’s University Affiliate program provides educational institutions with access to the rich musical history and archives of the GRAMMY Museum for educational purposes. Sielert first became aware of the opportunity to apply for the program through Clinical Assistant Professor of Music Education, Lori Conlon Khan. Before moving to U of I two years ago, Conlon Khan taught in the Boise area for 30 years. She first became aware of the GRAMMY Affiliate program through Bob Santelli, who she met while participating in the American Roots Music Summer Institute hosted by the Idaho Humanities Council. 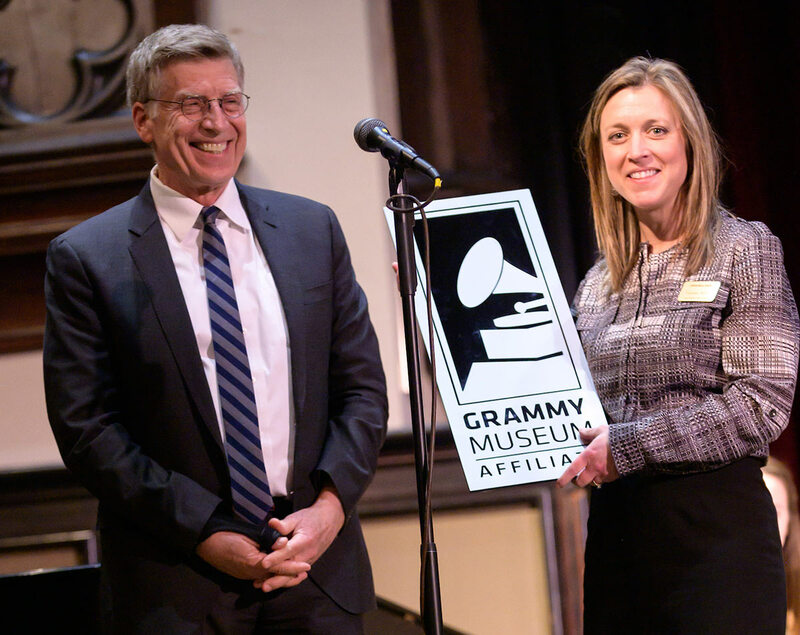 Santelli served as the executive director of the GRAMMY Museum in Los Angeles from 2008 to 2016, and is now the university director of popular music and performing arts at Oregon State University. Santelli formally presented Sielert with a GRAMMY Museum Affiliate plaque at Hamp’s Gala, the event that kicked-off the start of the 2019 Lionel Hampton Jazz Festival on Thursday, Feb. 21. Sielert is preparing for a trip to Los Angeles next month for her first GRAMMY Affiliate meeting, where she hopes to learn more about how the university can best take advantage of this new affiliation.